The once-powerful businessman who helped steer a multi-million-dollar school bus scandal was back in a Dallas courtroom Friday, this time as a witness for his ex-wife. Bob Leonard, who has admitted to bribing city and school officials in a conspiracy that cost taxpayers more than $100 million, took the witness stand in hopes of shielding his former wife from a related civil lawsuit. State District Judge Eric Moye ruled that Margaret Linda Leonard would remain a defendant, along with her ex-husband and others, in a legal effort to recoup some of the millions of dollars lost at the Dallas County Schools bus agency. In July, Dallas County Schools will be shut down forever. In November 2017 voters acted swiftly to close the 172-year-old agency after more than 100 reports from NBC 5 Investigates revealed corruption and staggering financial mismanagement that cost taxpayers millions of dollars. Facing a maximum 10 years in federal prison after pleading guilty to wire fraud in the criminal case, Bob Leonard took the witness stand on Friday – without his lawyers on hand – to say his former wife knew nothing about his business relationship with DCS. The corruption led voters to shut down the century-old bus agency, made possible through a dissolution committee, and brought down one of the most powerful politicians in Dallas – Mayor Pro Tem Dwaine Caraway. At Friday’s hearing, lawyers for DCS’ dissolution committee argued that Margaret Leonard was married and living with her husband in Dallas at the height of the conspiracy, and that she benefited financially from it. They also produced copies of checks, signed by “Linda Leonard,” that went to various political campaigns in Dallas. Margaret Leonard, however, disavowed the checks, telling the judge she did not sign them and that the signatures were not in her handwriting. It's been around for 170 years, the last two cloaked in controversy, but Tuesday spelled the end for Dallas County Schools. She said she only contributed to one campaign, her first ever, which went to former DCS board president Larry Duncan, who has since pleaded guilty to federal tax evasion in the corruption case. “My husband asked me to write a check out of my own account, so I did,” said Margaret Leonard, who, along with her former husband, now lives in the New Orleans area. 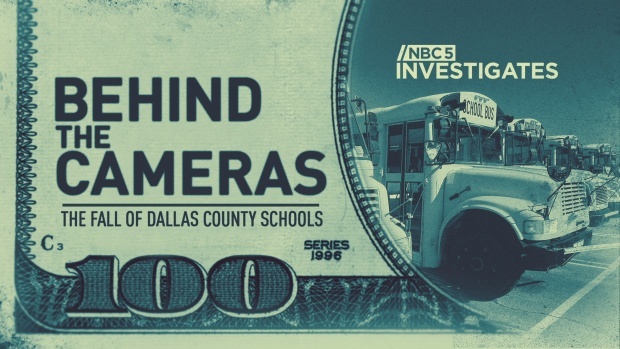 Bob Leonard, who declined to comment to NBC 5 Investigates at the hearing, is the former owner and CEO of Force Multiplier Solutions, the vendor hired to equip DCS school buses with surveillance and “stop-arm” cameras. The camera company reaped millions of dollars in the deal, facilitated with the help of former DCS superintendent Rick Sorrells, who has pleaded guilty to federal wire fraud. In the guilty plea, Sorrells admitted he took more than $3 million in bribes and kickbacks in exchange for pushing through the camera contract. For his part, Caraway pleaded guilty to tax evasion and wire fraud, admitting he took an estimated $450,000 in bribes and kickbacks in exchange for his political muscle at City Hall to help advance Leonard’s business with DCS. The fifth player in the conspiracy is Slater Swartwood Sr., a friend and business associate of Bob Leonard’s, who pleaded guilty to a federal money laundering charge, admitting he funneled millions of dollars in bribes – money that came from Force Multiplier Solutions. All five men are free, pending formal sentencing.